Comic artists and cartoonists in Arab nations and much of the Middle East have been cultivating a new era of cultural, social, and political importance of the media. These artists have been defiant, often risking their lives in the face of harsh censorship as their nations transition to more democratic governments. This comic renaissance has prevailed since the beginning of the Arab Spring, from Tunisia to the current struggle in Syria. According to an article on Qantara.de, a German website sponsored by various institutions whose goal is to inform the world about foreign social issues, artists in the Arab world have used comics — a medium historically seen as sophomoric in most Middle Eastern countries — to educate people about the rich cultural history of comics and to voice opposition to governments and religious institutions. This year’s Erlangen International Comic Salon, which took place from 7 to 10 June, introduced a series of young comics artists from the Arab world and presented their work in a high-profile exhibition. Hardly known at all in Europe until now, the work of these young artists has also been regarded in their homelands as peripheral to the art and cultural scene. As far as the general public in the Arab world was concerned, comics and animation films were for a long time nothing more than children’s entertainment. To this day, only a small amount of people know that the genre can address topical, even explosive subject matter. As well as publishing new stories, the initiators also want to make a point of informing people about their predecessors in this art form. The creators of TokTok are particularly keen for people to understand that their art did not develop out of nowhere, that it is not simply copying Western models, but is clearly rooted in a domestic tradition. Furthermore, political cartoonist Ali Ferzat has been a bastion of anti-censorship and political criticism in Syria and “…has no intention of letting the censors keep him down,” despite being violently attacked and injured by Syrian authorities, according to an article on IndexOnCensorship.org by Malu Halsa. The website was founded as a forum for reporting, analysis, and discussion of free expression issues. Three months before the start of the Syrian revolution in March last year, Ali Ferzat broke with his own satirical convention: he stopped using symbolism in his cartoons to criticize the regime and began to target identifiable individuals, including the president himself. He describes the shift as pushing through “the barrier of fear.” The first cartoon in Ferzat’s new series showed President Bashar al Assad agitated at seeing the traditional day of mass demonstrations against the regime, Friday, marked on a wall calendar. Another had him hitching a lift from Gaddafi making his own getaway in a car. 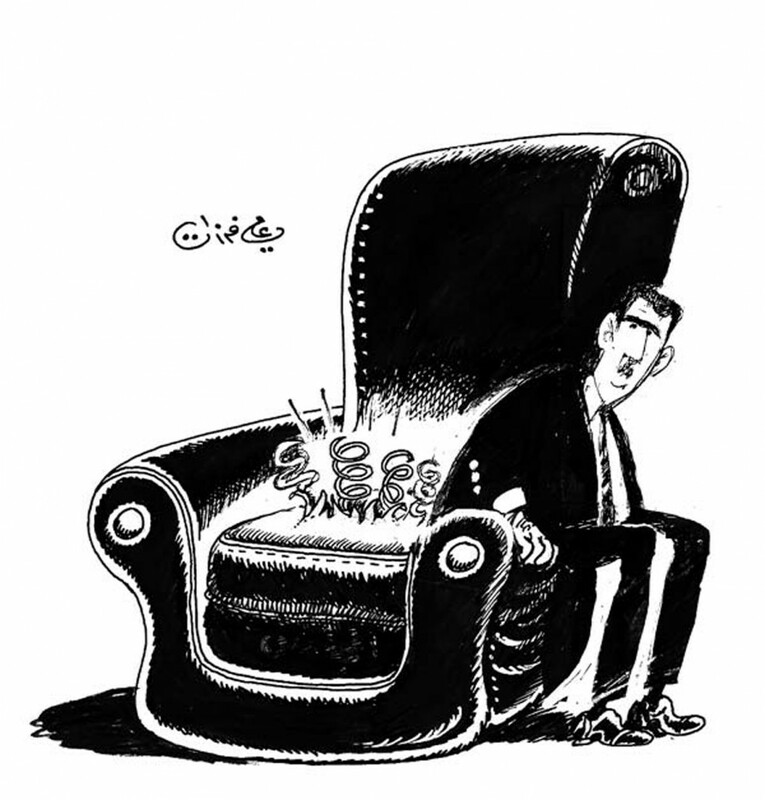 The third featured the “chair of power,” one of Ali Ferzat’s iconic symbols, with the springs popping out of the cushion and Bashar hanging onto its arm. Ferzat must have anticipated that his actions might lead to violent repercussions. Last August, pro-regime forces viciously assaulted him and broke both his hands. During the attack, one of the assailants yelled at him, “Bashar’s shoe is better than you.” Article 376 of the Syrian penal code makes it an offence to insult or defame the president, and carries a six-month to three-year prison sentence. Other forms of harsh persecution, suppression by intimidation, and censorship have been prevalent in Arab nations, in contrast to changing ideals, ousting and transitioning of governments, and the renaissance and public acceptance of comics and cartoons. One of the most dramatic events of the Egyptian Revolution was not captured on film, however. It happened on Friday, January 28, late at night, three days after Egypt’s urban centers were swept by violent riots. “Urgent: Egypt has shut down the Internet,” informed Issandr El Amrani his politics and culture website, The Arabist. “Egypt leaves the Internet,” wrote James Cowie at the Renesys blog (Renesys is a company which studies worldwide Internet traffic flows), and called it “an unprecedented government act.” According to Renesys, all Egyptian Internet providers (apart for Noor Group, which provided the connection for the Egyptian stock market) were cut off from the World Wide Web. Telecom Italia Sparkle – a major provider in Egypt –reported zero Internet traffic to and from Egypt as of half past midnight. Other reports also referred to the blocking of text messaging services. Theoretic and academic debates about the role played by online social networks in the upheavals in the Arab world and in Iran will most likely continue for decades to come. But in real time, the rulers of these countries had no doubt – or time to doubt – the Internet’s lethal potential. They acted against the web with all the means and audacity available to dictatorships. Since the beginning of the protests in Syria, the Internet has increasingly been developing into a forum for creative artistic dissent and for a long time now, it has been far more than just a means of exchanging information.For the online activists, graphics also have an important role to play alongside video. Moreover, many artists also use the Internet to declare their solidarity with the revolution and to condemn the violence in the country. This “discovery” of the Internet as a platform for the dissemination of artistic works is also giving fresh hope to Syrian comics artists. Even in the midst of brutal government crackdowns, suppression, and censorship, artists across the Arab world have brought new breadth to the comics and cartoon scene through protests, powerful perseverance, and the unconstrained expanses of the internet. Justin Brown is a journalism graduate of the Indiana University of Pennsylvania and is currently enrolled in Point Park’s journalism and mass communications graduate program.